This year we are celebrating the 500th anniversary of the birth of Andreas Vesalius with our fall festival, “Art, Anatomy, and the Body: Vesalius 500” on October 18. So much has been written on the Fabrica and its importance that it can be difficult to know where to begin. Why do Vesalius and his work remain so important to contemporary scholarship and anatomical study? The answer lies in his first and most famous book, De humani corporis fabrica. The title is translated as On the Fabric of the Human Body, although the “fabrica” in the original title can be best understood in terms of “craft”, “workings,” or “fabrication.”1 In other words, in this book Vesalius is interested in the functions of the body as a living system. Seven “books,” or sections, lay out the different systems and functions of the body, beginning with bones and ligaments and ending with the brain and sensory organs. The frontispiece to the 1543 Fabrica in our collection. Click to enlarge. As the frontispiece makes clear, Vesalius wanted the Fabrica to demonstrate the importance of reviving hands-on anatomy as central to medical knowledge and practice. The Fabrica was a landmark publication, representing a turning point in the European understanding of the body and a new level of beauty and accuracy in its depiction in anatomical texts. 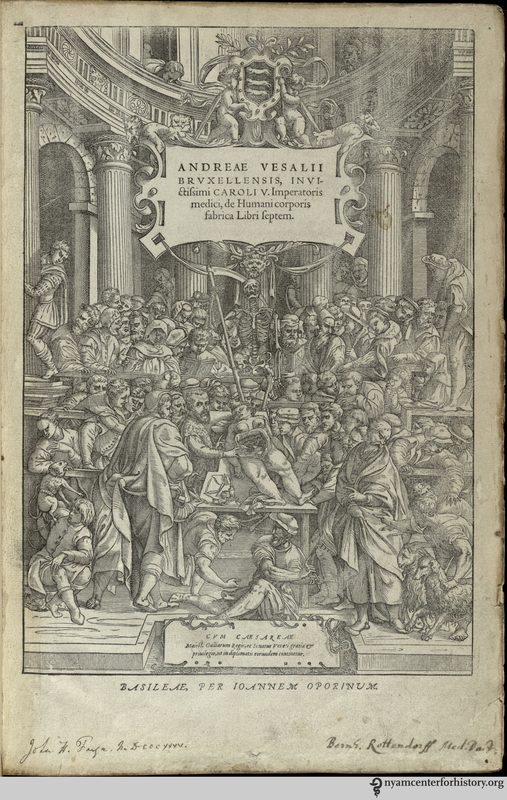 At the time of its publication in 1543, Vesalius was a professor at the University of Padua, one of Europe’s best known medical schools. Only 28, Vesalius came from a long line of physicians. Like many of his forebears, he subsequently entered the service of the Imperial Court of Charles V, to whom he dedicated the Fabrica. He worked closely with his printers, wood carvers, and artists to ensure the accuracy and beauty of the over 300 woodblock images in the book.2 The Fabrica was exceptional in terms of both production and content, and its iconography, principles, and pedagogical approach were rapidly incorporated into medical thinking and teaching. 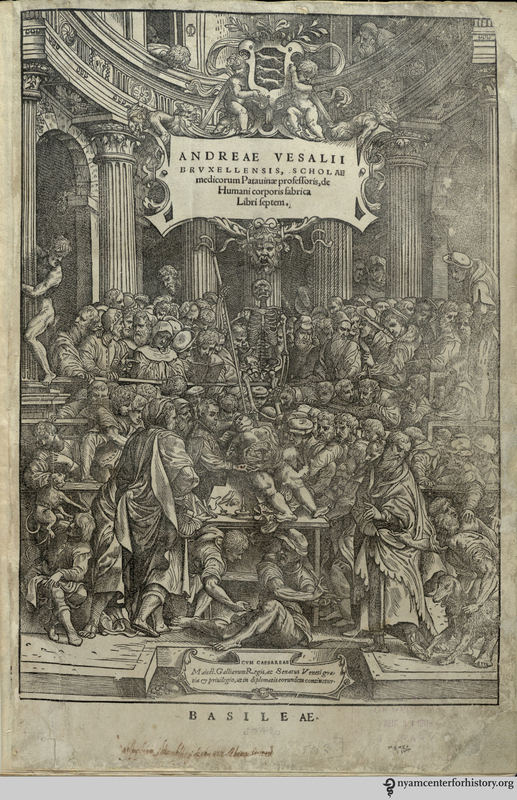 While the Fabrica is now remembered as the point at which a new, “modern” emphasis on direct observation and experimentation replaced deference to ancient authorities, Vesalius was careful to ensure that his erudition in the classical tradition was on display. Quotations of Greek, Arabic, and Hebrew texts point both to his determination to show the breadth of his knowledge and to the expertise of his typesetters. Vesalius used such authorities to place himself in an established tradition, even as he questioned aspects of accepted Galenic thought. The frontispiece to the 1555 Fabrica in our collection. Click to enlarge. Covers of two Fabricas in our collection. The 1543 volume, left, has alum-tawed pigskin over wooden boards with elaborate decorative tooling and stamped designs and two brass fore-edge clasps. 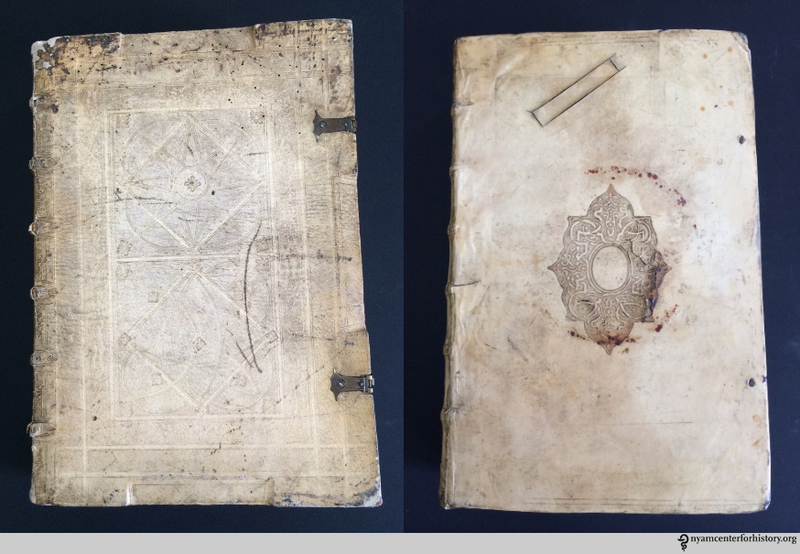 The 1555 edition, right, is bound in a contemporary parchment binding over stiff pasteboards with a single panel stamp. Click to enlarge. We are in the enviable position of owning multiple copies of the Fabrica as well as its companion piece the Epitome, a briefer volume designed for students with enlarged illustrations to aid the identification of individual features. In addition, we also hold multiple copies of the Icones Anatomicae, an extraordinary 20th-century artifact created in 1934 by The New York Academy of Medicine and the University of Munich, using the original 1543 wood blocks to reproduce illustrations from the Fabrica and Epitome (this was the last time images were taken from the woodblocks; returned to Munich, they were subsequently destroyed by Allied bombing during WWII). All of these volumes will be available to view at the festival on October 18. You will also be able to learn more about Vesalius and his work: Daniel Garrison will discuss translating the Fabrica for the new English-language edition, Arlene Shaner will explore the story of the Icones Anatomicae, and Drs. Jeff Levine and Michael Nevins will provide a guide to the possible stories hidden in the changes made to the Fabrica frontispiece between the first and second editions. 2. The identity of the artist responsible for the wood blocks remains unclear, although many have argued that Jan Stephan Calcar, a student of Titian, was responsible. See Vivian Nutton’s introduction at http://vesalius.northwestern.edu/. 3. More details about the life and impact of Vesalius can be found online in Vivian Nutton’s introduction and other essays at Northwestern’s Annotated Vesalius project: http://vesalius.northwestern.edu/ and in C. O’Malley, Andreas Vesalius of Brussels, 1514-1564 (Berkeley: University of California Press, 1964). This entry was posted in Collections, Events, History of medicine and tagged 16th Century anatomy, anatomy, Andreas Vesalius, Art and the Body: Vesalius 500, De humani corporis fabrica, event, On the Fabric of the Human Body by nyamhistorymed. Bookmark the permalink.